Marquette junior guard Derrick Wilson (left) said teammate Juan Anderson and the Golden Eagles "need to get a win" Saturday against New Mexico. MILWAUKEE — There have been two distinct portions of Marquette’s non-conference schedule, one featuring a few of the nation’s best teams and the other providing the Golden Eagles nothing but games to work on themselves for 40 minutes. A good chunk of the high-major college basketball teams play a similar schedule, but winning games in the tough part of the schedule is what separates teams come March. The Golden Eagles are just 1-4 against teams ranked in the top 100 of the Ratings Percentage Index, a record that could come back to bite them come tournament time. Marquette’s final chance to add a big non-conference win to its resume comes Saturday against New Mexico at the MGM Grand Showcase in Las Vegas. "We need to get a win," Marquette junior guard Derrick Wilson said. "It will be tough, but we need to get this one." Thus far, Marquette’s best non-conference win is over George Washington in the Wooden Classic at Cal State Fullerton. The Colonials have surprised many and are ranked 27th in the RPI with a 9-1 record, including a win over Creighton. But the Golden Eagles’ six other wins have come to sub-200 RPI teams, as their next-best win based off RPI is Grambling State at 214. Marquette dropped a close road game to Wisconsin (1st in RPI), lost what essentially was a road game on a neutral court to San Diego State (25th RPI), lost another close road game to Arizona State (100th) and was blown out at home by Ohio State (12th). While the Lobos currently are 45th in the RPI, New Mexico is talented, and beating the preseason Mountain West favorites will be a boost to Marquette’s body of work come tournament time. New Mexico has three players averaging more than 16 points per game, including the frontcourt tandem of 6-foot-9 senior Cameron Bairstow and 7-foot junior Alex Kirk. The duo combines to average 37.2 points, 16.6 rebounds and 4.3 blocks per game. "They are really good," Marquette coach Buzz Williams said. "I would have to think because I don’t want to discredit anybody, but I’m not sure that in my tenure here that we’ve played a frontcourt combination as potent as theirs. They are playing at a high level." Longtime assistant Craig "Noodles" Neal took over as head coach after Steve Alford left for UCLA in the summer and inherited a roster loaded with talent, including preseason Mountain West player of the year Kendall Williams. The Lobos have dropped three games this season, including back-to-back losses to Kansas and in-state rival New Mexico State. New Mexico really missed the intangibles of starting guard Hugh Greenwood against the Aggies, and he won’t play against Marquette on Saturday. "I think ‘Noodles’ has done an incredible job," Williams said. "There’s a lot of carryover from how they played in the past. They are a hard matchup. They are going to get it inside 95 percent of the time. They are really good. "I would put them in the same category of Ohio State and Wisconsin. I know nationally they aren’t known like that, but statistically if you look at their numbers, they are really impressive." The other challenge facing Marquette on Saturday will be the number of New Mexico fans that will make the short trip over to Las Vegas for the game. While it’s different than playing in Albuquerque at The Pit, the Golden Eagles will essentially be playing a road game. They’ve already had two "neutral" contests that were really road games this season, as the Cal State Fullerton game was played on the Titans’ home court and San Diego State had thousands of fans in Anaheim for the championship game of the Wooden Legacy. "I kind of resisted this one," Williams said of the scheduling of this game. "I think (deputy athletic director Mike) Broeker is the best in the country at studying all of the different numbers that go into what the tournament committee studies. I think as it plays itself out, the totality of our schedule has been the right thing. But it has been a grind up until this point. "Is it the right play? I don’t know if we could answer that until Valentine’s Day. I think on paper it’s the right play. It’s not so much who we’ve played, it’s the timing of when we’ve played them, which is driven by TV. We need as much exposure as possible like every other program, but we were gone eight days, four games on the road and two of them were straight-up road games." Williams compared Marquette’s non-conference schedule to playing two conference schedules and says his team has to continue to mature to be able to withstand the grind this season will present. He’s stressed continued growth from a team needing inexperienced pieces to contribute all season long and that continues with this trip. "Here’s the deal," Williams said. "We’re going to play in Vegas and they are going to have about 8,000 people in the casino. But before we ever get to the casino, are we going to have to chase you all over Vegas to wonder if you are sleeping?" The Golden Eagles have one game left in each of the two portions of their non-conference schedule, as they return home to face Samford before starting Big East play at Creighton on New Year’s Eve. 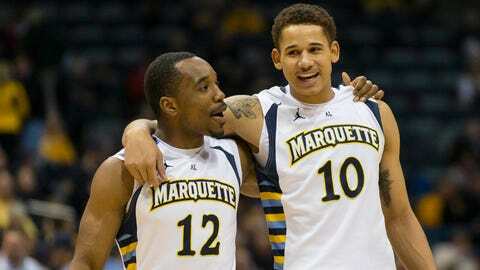 Marquette has shown progress, no doubt. But now it’s time to win, as a bunch of close losses won’t get the Golden Eagles into the NCAA tournament. "It’s not stopping," Williams said. "It’s going to keep coming and we’re going to have to mature to handle what’s coming our way. You can keep saying it was a tie ballgame last media timeout against San Diego State and at Arizona State, but you lost. You lost. That’s it."